It’s Friday and I’m already thinking about weekend brunch. And who doesn’t love brunch? 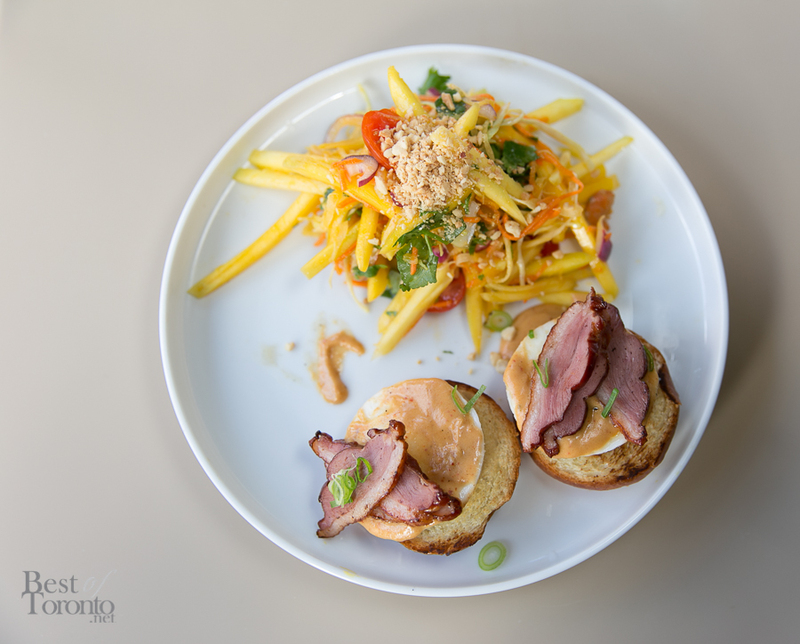 Now there’s a new way for you to enjoy weekend brunch, Thai style, at Linda Modern Thai. It’s a perfect way to kick back and relax with really, really good food at the Shops at Don Mills. Owner Alan Liu explains that all the ingredients are made from scratch to maintain the restaurant’s high quality standards. First I had a Thai coffee with this distinct pouring method and condensed milk. Next time I would just have it black, it didn’t need the dilution. I really love eggs benny so I had to choose the Thai-style Eggs Benedict with delicious, smoked duck breast with Panang curry on a butter brioche. The combination was so delectable, on par with the best of the eggs benedict I’ve tried. I paired it with a side of fresh mango salad – a very generous portion. The brunch dishes all come with a side of panthongko (Thai dough fritter, similar to the Chinese variety) and a delicious sankaya (Thai coconut egg custard spread). The price is on par, too, for the quantity and quality you get at $15. 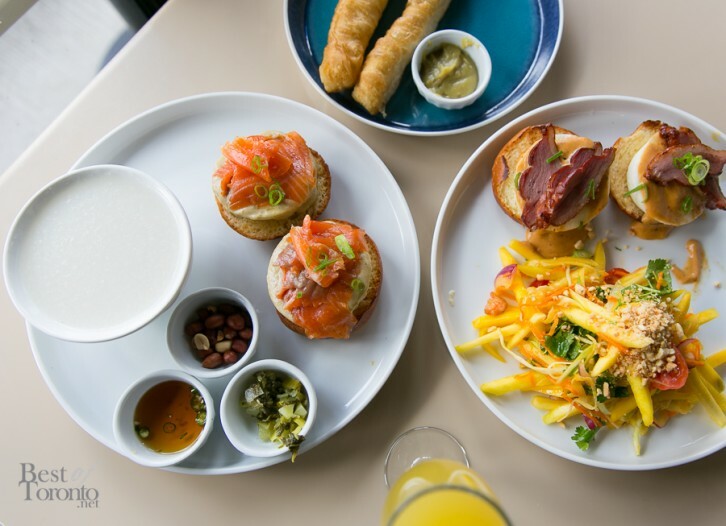 The fritter and custard spread goes well with the side of Thai congee, too (pictured above with Eggs “Benjamin” smoked salmon with green curry). And if for some reason you just want traditional brunch, you can have that, too. Also on the brunch menu are steak & eggs, but I would be more interested in trying the Roti Gulay next (Thai banana egg pancake). Only $13. Either way, if you love brunch I highly recommend trying the #ThaiBrunch at Linda Modern Thai. The weekend brunch menu is available Saturdays and Sundays from 11am to 3pm. For the full Thai Brunch menu click here. Linda Modern Thai is the first Thai restaurant in Canada to receive a “Thai Select Premium” designation for by the Government of Thailand’s Thai Department of International Trade Promotion (DITP). Also check out our coverage of the celebratory dinner when Linda Modern Thai was bestowed the Thai Select Premium designation.